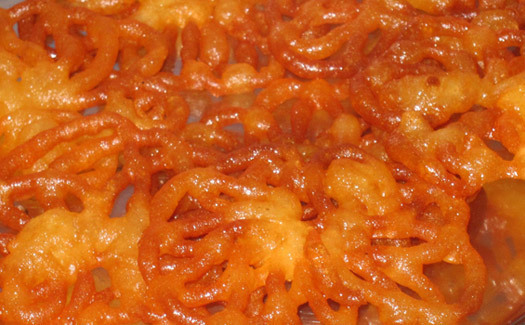 Jalebi is a popular sweet in India as well as neighboring Pakistan, Bangladesh, and Nepal. Jalebi is made by deep-frying flour batter in in various circular pattern and shapes and soaking in sugar syrup. Jalebi is often served warm or cold. Jalebi is often served during celebration holidays such as Independence Day and Republic Day. Imarti is a dessert similar to Jalebi, but reddish in color and sweeter. Also spelled Jalibi, Jilebi, and also called Jilapi. Mix the flour, besan (chickpea flour), yogurt and water. 2 Set aside for about 3 hours to ferment. 3 Prepare sugar syrup by dissolving sugar in warm water. Optionally add saffron and cardamom pods for flavor. 4 Heat oil to medium for frying. Carefully pour the batter with a pastry bag or Ziploc bag with hole into oil by making coil shape. Fry until they are dark golden color. Make sure not to burn it. 5 Remove from oil and drain with paper towel for few seconds. 6 Immerse in the sugar syrup for 30 seconds to minute. Take Jalebi out of the syrup and serve hot or cold. The tip for good Jalebi is to eat it fresh when it is still warm and crispy.